A Fabulous holiday was had by all! Hello Everyone!! I hope your holiday was full of great food, family, friends, fun, and happiness!! I have been seeing lots of fabulous photos on your blogs!! Some gorgeous table settings I might add!! Aaron and I had one of the best Thanksgivings in years! We spent the day with the most important people in our lives! This year my sister and I decided to make a bunch of "new" sides to bring to my parents. My goodness.....we had Martha's homemade Macaroni and Cheese....Country Living's roasted sweet potato casserole with praline streusel, Paula Dean's Pineapple upside down biscuits, and so many other fabulous things! My pumpkin swirl cheesecake was a big big hit! It really was deeeelish!! I kicked it up a notch or two by adding a layer of a sweetened vanilla and cinnamon whipped cream, and topping it with bourbon maple pecans from Whole Foods! To die for!! I will be sure to make it again and again!! We truly ate enough for a week! And we continue to eat all sorts of snacks and sweets that we took home! Another highlight of the holiday was baby Adam....Aaron's brother's first child. He is amazing! Such a doll! He has gotten so so big! He is a little over 5 months now. I will be sure to post pics of him soon! He has the biggest blue eyes!! Walt came over to Aaron's parents too. He was shocked at how tiny Adam's fingernails were...and his two tiny bottom teeth! He had to whip out his camera phone for a few pics! This was the first time in over 30 years that Barb (Aaron's mom) hosted Thanksgiving. Usually we all go down to Mom Mom's house in Barnegat. Which is about an hour or so away. So usually after our dinner at my parents we rush to get down there to Aaron's family for dessert. It is always seems so rushed. This year was much more relaxed and easy. I think Barb had a good time. She is always a great hostess! The torch is now passed! The year that Barb became a grandma...fitting huh? Aaron, Walt and I drove Mom Mom home at the end of the evening. It was a great time! We love visiting with her! It is non stop conversation. She is so sharp and fun! It was a great day! This weekend was spent filling orders! We are up to our ears in ornaments! Really!! Stacks and stacks of pink bakery boxes are piled high around the apt! We will be shipping a bunch tomorrow. and then it is back to ornament making! So glad that they were so well received! Thank you to anyone who has ordered some! We are honored to be a part of your holiday! Up above are some of my Wish list items!! Are you drooling as much as I am?? My goodness!! 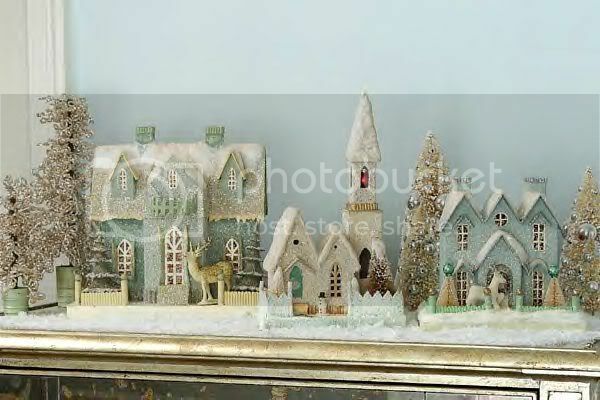 How fabulous are these houses?? They are from the fabulous Room Service Home! 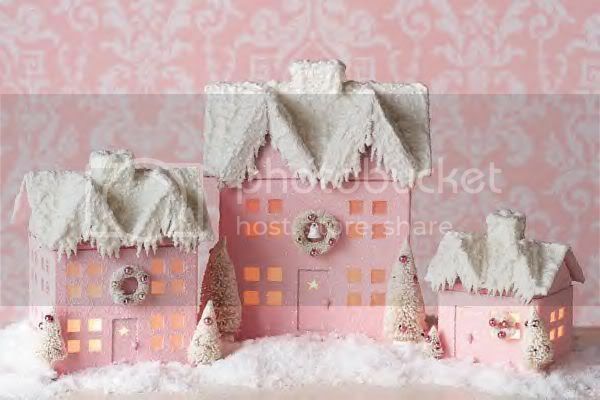 The pink houses are actually currently sold out..boo hoo...I had to share the photo with you anyway! Such eye candy!! Maybe I will try my hand at creating my own version of them. Aaron and I made a few vintage inspired cardboard glitter houses last year...lots of fun! I will post pics as soon as we unpack all of our holiday items! We are still searching for a new white tree....no luck yet..I will keep you posted! Well, I have lots to do before bed!! I hope to post again tomorrow. My apologies to any of you dolls that I owe emails to! I promise tonight or tomorrow!! I haven't forgotten you!! Hi Jenny- your dinner sounds incredible! It's making me hungry! Glad you had such a great family time. Those villages are the MOST beautiful and now I think the blue one is on my Christmas list. Yikes! Fantastic - thanks for sharing! In fact, all the things you've been sharing are wonderful - I'll have to go back and hit some links! Jen, have you checked at Target for a white tree? Ours had them, although i don't know how expensive. I know also that Dollar tree has short white trees.